Democratic Republic of Congo's President Joseph Kabila holds a news conference at the State House in Kinshasa, Democratic Republic of Congo Jan. 26, 2018. When the Southern Africa Development Conference meets Tuesday to discuss the Democratic Republic of Congo’s efforts to hold elections and stabilize the country, the DRC’s leader might not attend. “What he has demonstrated is he doesn’t want to organize the elections,” Fayulu said. 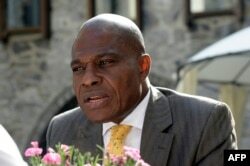 Fayulu discounted the government’s statements that it’s preparing for elections, now scheduled for Dec. 23. He said there’s evidence that government officials have interfered with the work of the Independent National Election Commission, known as CENI. “We want a credible transference election, and Mr. Kabilia is not ready to organize those elections,” he said. The leader of the DRC opposition party Engagement for Citizenship and Development, Martin Fayulu, talks to the media on June 10, 2016 in Genval, outside Brussels. Kabila’s term in office was to have ended in December 2016, but the government repeatedly has postponed elections. Part of the delay, according to the government, has been the sheer logistics of arranging an election in the vast, impoverished Central African nation of 83 million. Kabila has been in office 17 years and has grown increasingly unpopular. His refusal to hold elections in 2016 has prompted numerous protests. The United Nations Security Council, in a December report, noted that “political tensions have been exacerbated by the DRC government’s curbing of political freedoms of the opposition and curtailing the freedom of the press.” It cited another report tallying at least 53 anti-government protesters were killed during demonstrations. 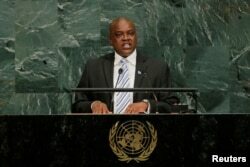 FILE PHOTO: The then vice president of the Republic of Botswana, Mokgweetsi Masisi, addresses the United Nations General Assembly at U.N. headquarters in New York, Sept. 21, 2017. In a rare move, Botswana’s President Mokgweetsi Masisi last week urged Kabila not to seek another term. Masisi took office earlier this month in one of Africa's most stable democracies. Masisi said in an interview with London's International Institute for Strategic Studies that he hoped to see a commitment from Kabila to leave office at year’s end. “It’s a generally held view (that Kabila should not run), though we don’t really enjoy it when our president or one of our leaders has commentary on other counties,” Dihutso said. However, he said, people elsewhere in Africa often like it when Botswana’s leadership speaks out. “I think internationally, it improves our status, our stature in Africa, because we generally get appreciated by a lot of African countries” for Botswana’s long history of peaceful, democratic political transitions.